The U.S. economy relies to an increasing extent on immigrants for its innovative impetus. 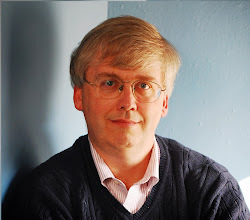 Consider two figures from William Kerr, writing in the NBER Reporter (2013, Number 4, pp. 13-16). 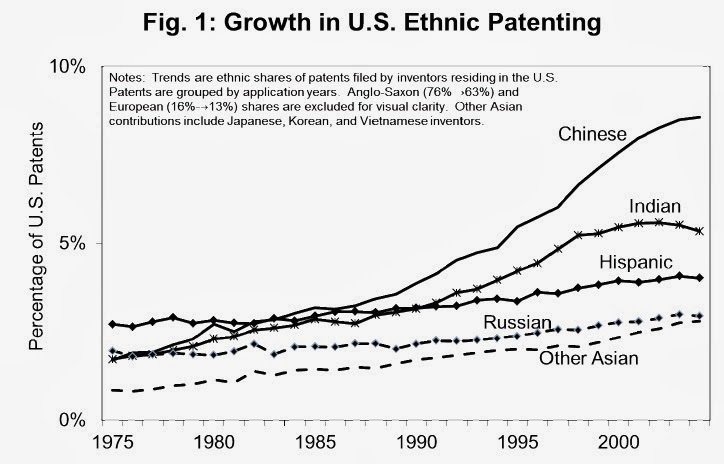 The first graph shows the share of U.S. patents received by various ethnic groups. The inventor needed to be living in the U.S. to be counted in this tally, but didn't have to be a U.S. citizen--at least not yet. 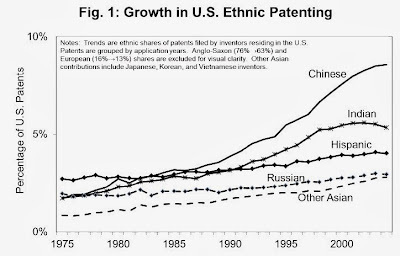 Kerr writes: "Figure 1 shows the tremendous increase in the ethnic contribution of U.S. inventors over the last 30 years, focusing only on inventors residing in the United States at the time of their work. 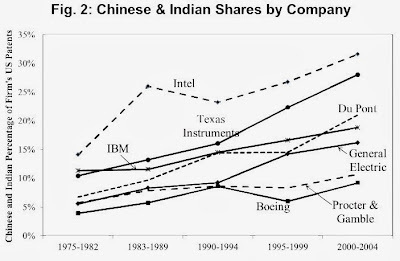 The contribution of Chinese and Indian ethnic inventors displays exceptional growth, increasing from under 2 percent each to 9 percent and 6 percent respectively. Ethnic contributions are disproportionately concentrated in high-tech fields ..."
Here's a similar count broken down by company. 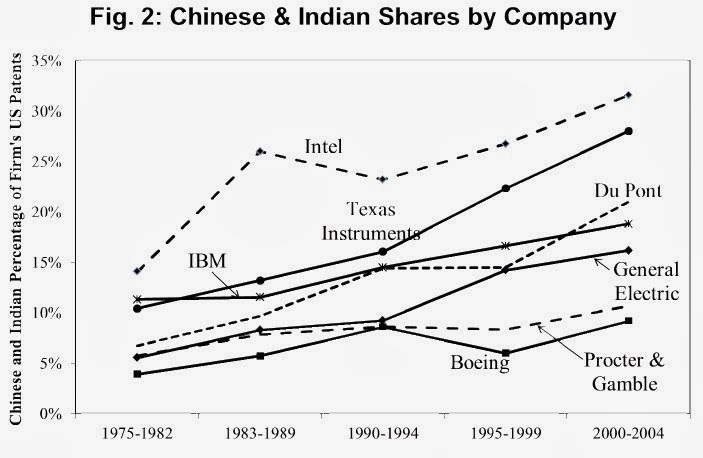 This figure shows the share of patents by inventors of Chinese or Indian ethnicity for some high profile U.S. firms. Many of these inventors are only in the U.S. on short-term H-1B visas, which seems foolish. We can argue back and forth about the issues involved in immigration of low-skill workers to the United States. But in a globalizing economy, high-skill immigrants bring a combination of technological moxie and international connectedness that can be deeply valuable. Even if one just looks at high-skilled workers, innovation is not a zero-sum game: Kerr's research shows that when the number of high-skill immigrants on short-term visas rises in a city, and the innovation rate rises, the innovation rate for for other inventors in that city seems to rise slightly, too. It surely looks as if U.S. innovation is being sustained by recent arrivals and people who are here on a short-term basis. The U.S. education system and economy is a magnet for global talent, and we should play to that advantage.